This is what you do when you’re in search of a winter blues perk up that does not include tequila. Not that tequila won’t work, but on a Monday at noon it miiiiight not be the best idea. Or it definitely will be the best idea and just isn’t feasible. Because I need some major color in my life. It’s no secret that I’m sort of existing on chocolate chip cookies with some smoothies thrown in and then some pizza and maybe a few loose spinach leaves. And then stale gummy bears and coconut water and apples with peanut butter and chocolate chip cookies again. In order to actually eat salads, they need to be downright gorgeous and FUN. I can barely take how much I adore this salad. Yes, the color alone sells me – I mean, it’s probably as close to a neon salad that we are going to get. At least a neon salad that doesn’t kill us. But there are so many components that make this THEE salad for me. First, it’s chopped. If I could eat all salads chopped for the rest of my life, I’d be good. Well, except for the occasional grilled romaine caesar. The sweet potato adds enough OOMPH for me to consider this is a meal which is, in itself, huge. The blood oranges are super pretty and of course delicious, even if they cost more than the shoes I bought last week. The pomegranate gives me crunch and texture and POP. And my must have for chopped salads: crumbly cheese. I often choose feta because of the wonderful tang, but goat or gorgonzola would work too. Since it’s all crumbled, you actually get bites of cheese in pretty much every forkful. It’s like a snowstorm on your salad. 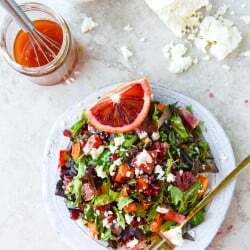 Can’t forget the blood orange vinaigrette – because it’s sweet but savory and perfect. And pretty! Look at that pink. If only all foods were pink. Like broccoli. If broccoli could be pink? My life would be so much easier. Preheat the oven to 400 degrees F. Line a baking sheet with parchment paper. Toss the sweet potato cubes with the olive oil and maple syrup. In a small bowl, whisk together the salt, pepper, garlic powder and paprika, then toss the sweet potatoes with it. Roast for 15 minutes, flip and roast for 10 to 15 minutes more. Use the potato warm or cold – it’s your preference! Add the chopped greens to a large bowl and sprinkle with a bit of salt and pepper. 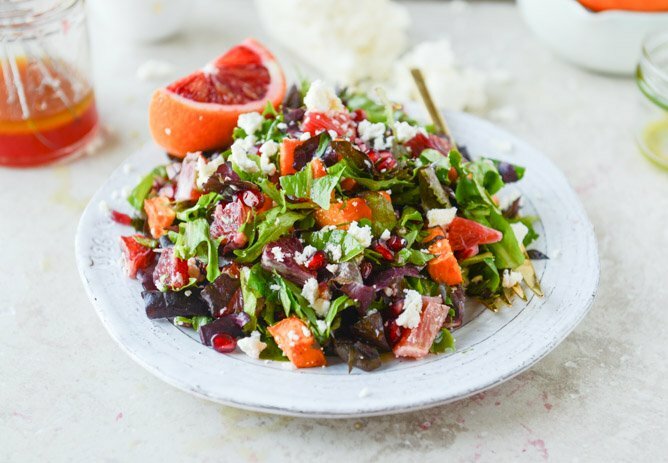 Toss the greens with the potato, oranges, arils and feta. Top with the vinaigrette and serve. Combine orange juice, vinegar, garlic, salt and pepper in a large bowl and whisk together. Stream in the olive oil while constantly whisking until the dressing comes together. Store in the fridge for up to one week. This was so delicious! Thanks for the recipe! What a wonderful springy looking salad! Can’t wait to try! 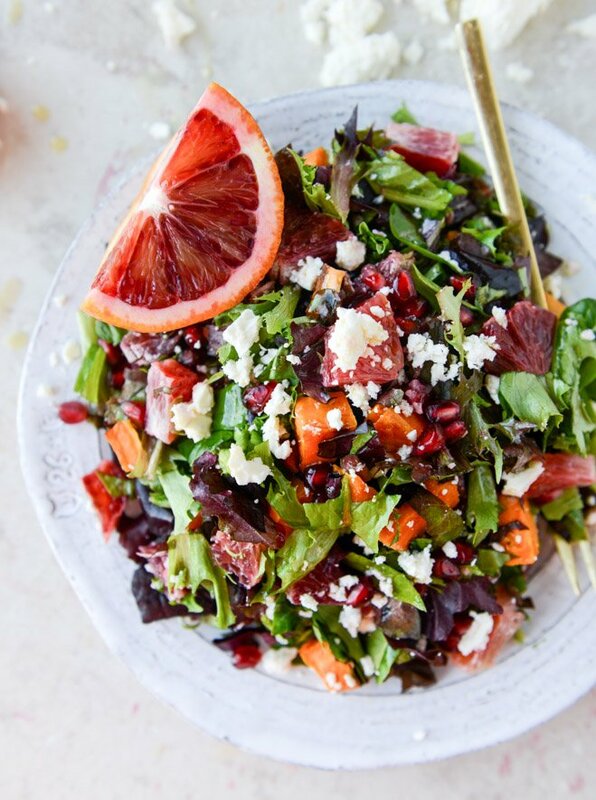 Love everything in this salad except the sweet potato. Any suggestions for a substitute? This has become a regular in our rotation! My 8-year-old daughter specifically asks for it several times a month. I was initially iffy on the idea of sweet potatoes in my salad, but they’re really rather perfect. We usually use red kale, but I’ve also used well-massaged collard greens with good results. Both seem to stand up to all the “stuff” in the salad even better than lettuce, we find. I’ve used Stilton and goat cheese when I didn’t have feta, and both were good alternatives. Also, when pomegranates are unavailable, I usually toss in some candied walnuts or pecans for a bit of crunch and sweetness. Made this for a Christmas party last night, it was a hit! Colourful, interesting, nutritious, filling. The pic certainly grabbed my attention. Also, I love sweet potatoes. Nice recipe. I’ll try it.